Ready to see a retrospective of your art? Check out the Slide Show option, which automatically displays pictures and movies one by one. You can view the show on the camera monitor or, for a better view, connect your camera to a TV for playback. One nice aspect of the Slide Show function is that you can specify which files you want to include. You can tell the camera to show just still photos, for example, or to display only photos that you rated highly using the Rating feature. You see the screen shown on the right. The thumbnail shows the first image that will appear in the slide show if you stick with the current show settings. Use the cross keys to navigate to the file-selection box. The file-selection box becomes active, with up and down arrows appearing to its right. Date: Plays pictures or movies taken on a single date. As soon as you select the option, the DISP label underneath the option box turns white, clueing you in to the fact that you can press the DISP button to display a screen listing all the shooting dates on the memory card. Again, press the up or down cross keys to select a date and then press Set to exit the date list. Folder: Includes still photos and movies in the selected folder. Again, press DISP to display a list of folders and highlight the one you want to use, and then press Set to exit the folder list. Rating: Selects photos and movies based on their rating. Press DISP to display a screen where you can specify the rating that qualifies a file for inclusion and to see how many files have that rating. After selecting the rating, press Set to exit the rating screen. The file-selection box is deactivated. Highlight Set Up and then press Set. Transition Effect: You can enable one of five transition effects. (Experiment to see which one you prefer.) Choose Off if you don’t want any effects between slides. If you do add music files to the memory card, use the Background Music option to enable or disable the music accompaniment. Leave the option set to Off, as it is by default, if you don’t want to mess with this whole issue. After selecting your playback options, press Menu to return to the main Slide Show screen. Highlight Start and press Set to start the show. Use the camera buttons to control playback. Pause/restart playback: Press the Set button. While the show is paused, you can press the right or left cross key to view the next or previous photo. Press Set again to continue playback from the current slide. Change the playback display style: Press the DISP button to cycle through the available styles, each of which presents different shooting data. Adjust audio volume: Rotate the Main dial. 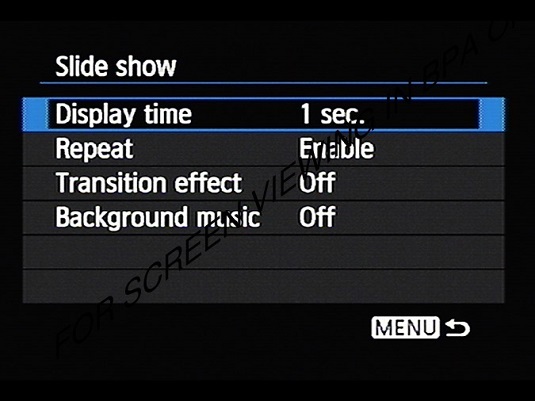 Exit the slide show: Press the Menu button twice to return to Playback Menu 2. Or press the Playback button to return to normal photo playback.